Machaeranthera are half hardy annuals that reach about 60 cm in height. 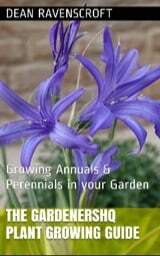 They have blue flowers resembling those of daisies that flower from summer through to the autumn. There size makes them an ideal plant to grow in borders. 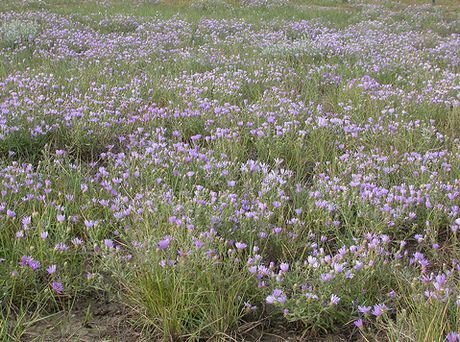 Common names for Machaeranthera plants include Tahoka daisy and Tansyaster. Both photographs of Machaeranthera canescens – Hoary Tansyaster by Matt Lavin; creative commons. 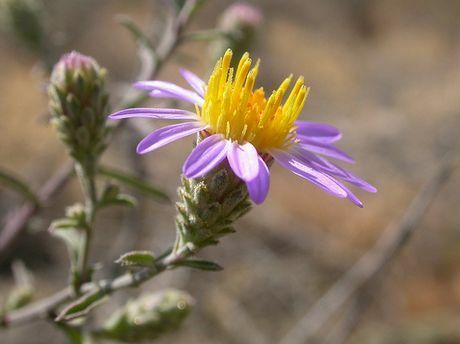 Common Names: Tansyaster, Tahoka Daisy, Rushlike Bristleweed, Wild Aster. Tansyaster: Hoary; Fall; Arid; Gypsum; Lacy; Mesa; Sticky; Silver lake; Slender. Flower Details: Purple, blue, yellow, white, pink. Daisy-like ray and disc florets. Knife shaped anthers. Sow Outside: Surface. Before last frost or in autumn. Spacing 8 to 12 inches (20 to 30 cm). Sow Inside: Mix seeds in a growing medium, place in a freezer bag, keep moist, then stratify by refrigeration for two weeks. Germination time: one month in the light. Temperature 70°F (21°C). Seven or eight weeks in advance. Transplant outdoors following the last frost. Requirements: Full sunlight or light shade. Good drainage. Soil pH 6 to 7. Ordinary soil. When growing Tahoka Daisies outdoors from seeds they should be sown on the soil surface. This can be done either in autumn or just before the last frost of spring. Tahoka daisy prefer to grow in a sunny or partially shaded part of the garden and require good drainage. If you plan to first grow Tahoka daisies indoors then they should be started about 8 weeks in advance. The seeds should be imbibed by placing the seeds (within soil) in a black plastic bag, then placing in the fridge for two weeks. Seeds should then be sown out in the light at a temperature of 21 degrees Celsius; they normally take about three to four weeks to germinate. Seedlings should be transplanted following the last frost of spring at a spacing of about 25 to 30 cm. Once growing Tahoka daisy and other Machaeranthera plants look after themselves. If you require more daisies the following year it is best to sow them from seed.